NIGHT RANGER Jack Blades (bass/vocals) Brad Gillis (guitars) Kelly Keagy (drums/vocals) Joel Hoekstra (guitars) Christian Cullen (keyboards) There are a lot of reasons to celebrate the release of Night Ranger's ?Hole in the Sun,? notably that it marks the band's first studio album in a decade and commemorates the pioneering hard rock outfit's 25th anniversary as a band. But as has been the case throughout Night Ranger's heralded career, the best reason to celebrate is the music itself. There are a lot of reasons to celebrate the release of Night Ranger's ?Hole in the Sun,? notably that it marks the band's first studio album in a decade and commemorates the pioneering hard rock outfit's 25th anniversary as a band. But as has been the case throughout Night Ranger's heralded career, the best reason to celebrate is the music itself. ?People will hear this record and recognize our dual blazing guitars and vocals, and big choruses and melodic verses, because that's definitely how you can describe this album,? explains singer/bassist Jack Blades of the new release, the band's eighth studio album, and first for VH1 Classic Records. ?It's new Night Ranger, but in a lot of ways it's classic Night Ranger.? ?Classic Night Ranger?? Three simple words that could start their own chapter in the complex history of commercial hard rock, as the core trio of Blades, guitarist Brad Gillis and drummer/vocalist Kelly Keagy are responsible for penning a handful of the ?80s landmark hits, from one of the most defining and immediately recognizable epic power ballads of all-time in ?Sister Christian? and the similarly-slowed tempos of ?Sentimental Street? and ?When You Close Your Eyes,? to the guitar-driven radio juggernauts ? (You Can Still) Rock in America? and ?Don't Tell Me You Love Me,? Night Ranger are a rare band whose signature sound is more recognizable than their blue collar, every-man image. ?Even with all of our hits, people knew the band's name, but they didn't know the band,? recalls Gillis. ?The lucky thing is, 25 years later, we're still touring and making records.? 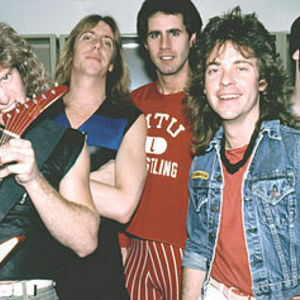 A little luck always helps, but in the case of Night Ranger, the proof remains in the music, as the band endure as champions of a music-first mentality seldom seen in today's image-conscious world. ?Songwriting is about experiences,? continues the guitarist, ?if you can write about things that everybody can relate to, it's those songs that come from the heart that usually hit the hardest.? Night Ranger hit hard throughout ?Hole in the Sun.? Guitars grind and swirl through the unrelenting opener ?Tell Your Vision,? delivering a progressively-fueled crush that sets the tone for the eleven new tracks that follow, from Keagy's Jim Morrison-like soft parade of vocals atop the blinding guitars of ?Drama Queen? and the blitzing melodic charge of ?You're Gonna Hear From Me,? through the enduring depths of the piano-driven power ballad ?There is Life,? and back again. ?Hole in the Sun? rings with the vibrancy of vintage Night Ranger, yet echoes with a modern relevance that endures throughout the album. ?We wanted to sound new, but still keep our roots,? says Keagy of the new release. ?We grew up in the ?70s, when pop music was really starting to thrive. Sometimes it drove you crazy because the songs were so poppy that you couldn't get them out of your head, but they were still amazing songs. We wanted to portray some of that on this album.? While there is definitely a pop glisten to ?Hole in the Sun,? there's also a heavy dynamic that plants the band firmly in the millennium. ?Brad brought in a lot of great ideas, some more modern-sounding things, but we were still able to keep that melodic sense in the songs. We wanted a lot of songs like ?Drama Queen,' great, gritty songs that reestablish our roots in hard rock,? continues Keagy. ?I love when people tell me that they used to drive around in the summertime with the windows down and crank Night Ranger, and they love reliving that with our music now,? the guitarist explains of his band's enduring fortune. ?Those fans continue to come and see us, but now we've also got a whole new audience coming, younger fans who are just discovering the band now. We're hoping to make an impact with every fan with this record.? Fixtures on the touring circuit since reuniting in 1996, Night Ranger wrote and recorded ?Hole in the Sun? between tours and individual solo projects, admittedly taking longer to complete than any of the band's previous albums. ?We're always touring, so we'd be going back and forth from the studio to the road and couldn't really concentrate all of our time at once and just get dialed in,? explains the drummer. ?We started to write the album in the summer of 2005, really got into it in 2006, and put the finishing touches on it in 2007. It was really a year-and-a-half in the making.? ?Music is constantly evolving and changing, and people need to keep evolving in life, spirit, soul and everything, or you might as well pack it in,? notes Blades. ?That's why I'm so proud of Night Ranger, and that's why we will continue to evolve. With this new album, we're just going to roll with it, have a blast doing it, and keep playing as long as it's fun, and as long as people want to come out and hear us play. There are still a lot of people out there that want to get up and sing, ?motorin'?' and ?Don't Tell Me You Love Me,' ?You Can Still Rock in America,' the list goes on and on?? Says Gillis of the band's current tour plans: ?We started with our classic backline with the American flag and the Night Ranger logo, and then we built it all up from there ? bigger lights, bigger sound, bigger everything! We've got the ramps, the vintage t-shirts, the old-school Night Ranger antics, and it's going to be nothing but fun?? The message is clear: You can still rock in America.